All right, let me be upfront about this before we wade into deep water: Every time I look at this painting, I get the distinct impression it was intended to be humorous, ironic and self-deprecating. Rather than the halo of sainthood, the penumbra behind the author’s head could well be the blazing hot Georgia summer sun, and that is no bible in her hand, brothers and sisters, but a pheasant (a game bird of the aristocracy, and not even one of her “signature” peacocks!). No way, I think, did she want future generations to pour over this happenstance bit of southern folk art (whose trademark is irony and a “dumber-than-thou” pose) as a mystical visual rendering of the author’s supposed sanctity, nor was it intended as a broad “hint-hint, look at me” that she was a candidate for sainthood. And as far as pheasants are concerned? Pardon me, but Flannery O’Connor has sent me off on many fruitless quests for elucidations of her symbolism and metaphorical flourishes. At any rate, others do not necessarily agree with me about this and want to reify the painting as an essential key to her rarefied (in their eyes) imagination. So. To the meat of this meaty matter. Flannery O’Connor’s literary reputation and influence, while modest during her mere 39 years of life, has grown like Topsy since her death in 1964. Her work is fierce, profound and profoundly mysterious, for her subject was faith, specifically the sudden unexpected moments of grace granted lost souls and thus the unlooked for and fleeting opportunities for redemption. Readers of all stripes are drawn to her and want to know more, want to find the mind, the source of inspiration, the life, if you will, that produced her wholly unique novels and collections of short stories. 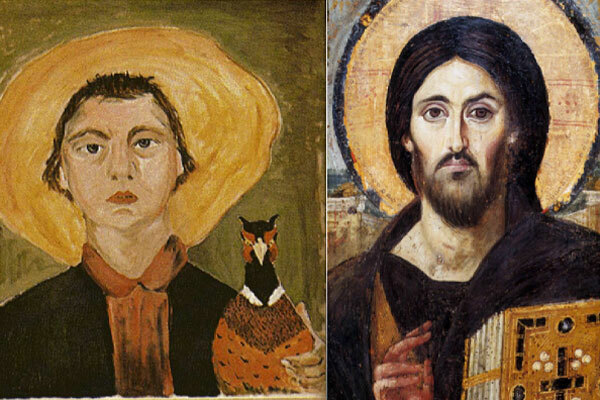 Eventually, if they are serious and persistent, they discover a stunning self portrait that Flannery painted which bears a striking resemblance to Christ Pantocrator. In pursuit of the meaning behind O’Connor’s blatant (or ironic lack thereof?) possession Christ-like qualities, what follows here are a few of the more fascinating, stimulating and far fetched assessments and interpretations of this painting, serious disquisitions which attempt to illuminate some of the dark corners of a major author’s genius and genesis. By the time O’Connor painted her self-portrait in 1953, lupus had already begun to take a vicious toll on her body, often leaving her swollen and in pain, and later, crippled. Critics debate the influence of O’Connor’s condition on her fiction, specifically with regards to the physical bodies of her characters, which are often deformed and distorted, if not blind or missing a limb. Physical violence and bodily discomfort permeate her written work. Her mother’s criticism notwithstanding, over the decade that followed, O’Connor went on to mention this self-portrait in letters to friends, enclose copies of it to pen pals she had never met, and beg publishers to include it on book jackets. 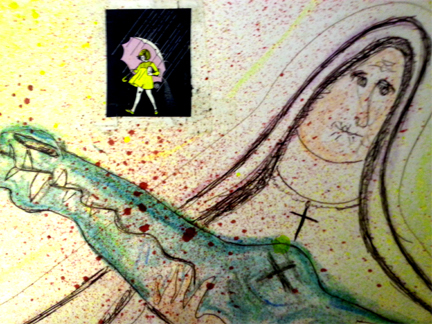 What could explain O’Connor’s fixation on the painting? This entry was posted in Literature, writing and tagged A Good Man Is Hard to Find, American authors, Catholic, Catholic authors, Christ Pantocrator, Christian Literature, Everything That Rises Must converge, Flannery O'Connor, Flannery O'Connor's Self Portrait, Harcourt, Joyce Carol Oates on Flannery O'Connor's Letters, Literature, Milledgeville, Milledgeville Georgia, New Yorker, University of Iowa, Wise Blood. Bookmark the permalink. Great post about my all-time favorite author. Very enjoyable, and thank you for the pingback. She is a stitch, isn’t she? So wickedly funny too. Thanks for the comment! well, it could be a big old straw hat, I guess, pushed way back on her head and not a halo after all. How like her to smirkingly confuse the issue. And a pheasant? Not even a dove? Let alone a Bible (see Christ’s image). She was contrary, impish, so witty. It was always her way or the highway. PS She always loved birds, and when she was a little girl she taught a chicken to walk BACKWARDS on a leash. The was filmed and made the local news at the time. I think the clip and voice over are on YouTube. Still available. You are probably right! Whether it is a hat or not, the imagery is definitely there, and the tongue-in-cheek would fit her style. I must go look for that now. Excuse me. Funny how she keeps us on our toes, somehow imparts a vague sense of unease and guilt and makes us laugh at the same time. If you haven’t read her letters, you should. Highly entertaining. She was a tireless, acerbic letter writer. Haha! Hahaha! That is sooo funny. The strangest thing to me (and lots of things about Flannery are…uh, well,…”strange” to me, although I have the highest regard for her work) is that she persisted in trying to get this portrait on her books as the author photo and next to her stories when they appeared in mags; she brought this up all the time whenever she could. Her publisher demurred (this is hilarious to me), saying it was a “bit stiff,” and Harper’s Bazaar (I think it was) declined as well, saying it was rather too “odd” to be used that way. What was she thinking??? Jeese. This sketch about Flannery O’Connor is very humbling. In fact, all of us who experience general good physical and mental health should be humbled by our fellows who haven’t been so lucky. Yes, indeed. She struggled against great odds. Wait a minute! That I do not see. And if (haha) it is a hat, it’s certainly not one I would wear!